Mix it live and send it all to your Mac or PC. The MultiMix 8 USB 2.0 FX is a compact mixer with built-in effects and a high-resolution, multi-channel recording interface so you can mix, record, and do both at the same time. Whether you are mixing a band or sub-mixing a group of inputs such as a drumset, the MultiMix 8 USB 2.0 FX is easy to use, rugged, and packed with features. Offering microphone inputs with phantom power, guitar-direct inputs, and line-level inputs for connecting everything else, plus a selection of stage-ready effects, the MultiMix 8 USB 2.0 FX delivers clean audio to your PA and recording systems. 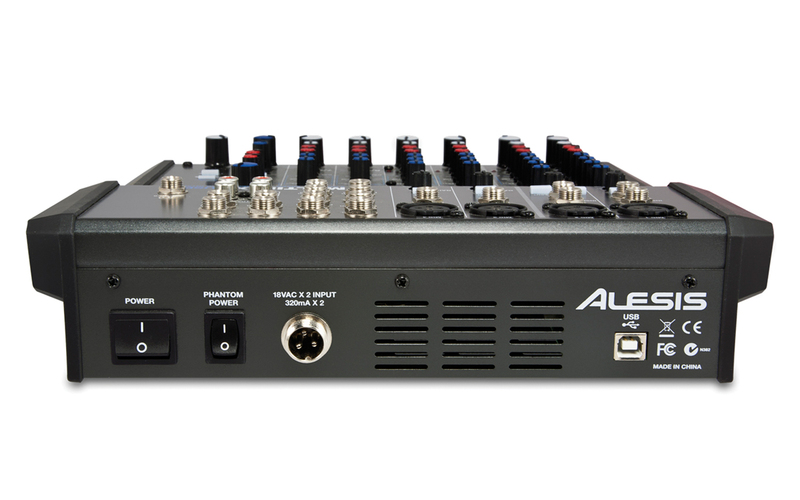 The MultiMix 8 USB 2.0 FX features four XLR inputs with independent gain pots on channels one through four. These XLR inputs also have a switchable phantom power option to accommodate both dynamic and condenser microphones. 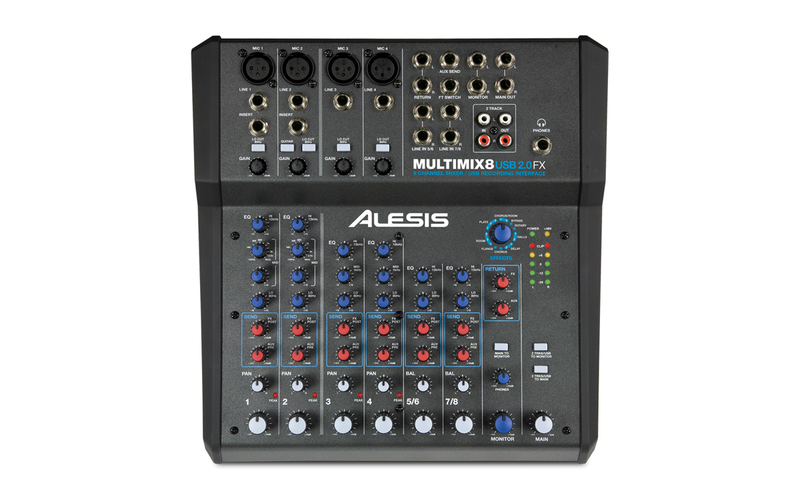 TRS Line inputs are also available on all eight channels of the MultiMix 8 USB 2.0 FX. A high-impedance input on channel two enables direct connection of a guitar or bass – a great convenience for singer/songwriters looking to get a clean, "hot" signal. A 2-Track stereo input is also included adding the ability to mix in audio from other sources such as a CD player, iPod, or sampler. Like the other mixers in Alesis’ MultiMix USB series, the MultiMix 8 USB 2.0 FX contains a complete USB recording interface. 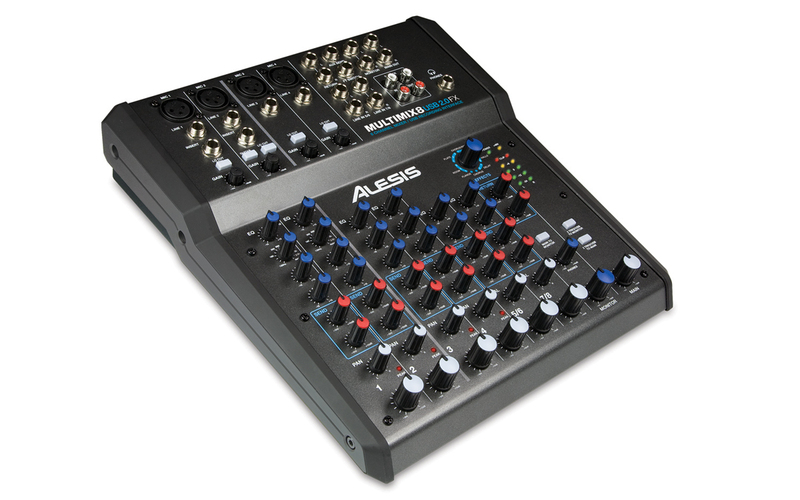 Where this mixer differs from others in the lineup is in its USB 2.0 technology. This enables you to send 10 channels (8 input channels plus the 2-Track input) individually to the computer, at up to 24-bit, 96 kHz resolution. Because each channel is sent individually, you can use virtually any DAW or other music software for mixing and editing the incoming audio. The MultiMix 8 USB 2.0 FX enables bidirectional stereo signal, so musicians can record the stereo Main output into their computer and listen back using the mixer as an interface from software to headphones and monitoring loudspeakers. Each channel features multi-band EQs, with channels one and two featuring sweepable, parametric midrange control for perfectly tailoring the sound of microphones. The MultiMix 8 USB 2.0 FX includes an internal effects processor to quickly and easily add new colors to your mix. Reverb, Delay or Phaser can be dialed up simply by adjusting the pre- or post-fader knobs located within each channel strip. The MultiMix 8 USB 2.0 FX also contains Aux Out and stereo Returns, as well as Insert jacks on channels one and two to allow for audio to be processed by external effects engines. MultiMix 8 USB 2.0 FX gives you an impressive amount of routing options in such a compact size. Enlarged knob-to-knob spacing improves ergonomics and in-use efficiency compared with the first generation of MultiMix mixers. Like the other members of the MultiMix FX line, the MultiMix 8 USB 2.0 FX incorporates new, removable endcaps, which can be helpful for squeezing into smaller spaces in tightly packed setups. In addition to its improved signal-to-noise ratio specifications, the mixer consumes 36% less power than its predecessor for reliability and energy efficiency.